Dar es Salaam (Arabic: دار السلام Dār as-Salām), formerly Mzizima, is the largest city, industrial center, and major port of Tanzania. Its name comes from an Arabic word meaning "Abode of Peace." Though it lost its official status as capital city to more centrally located Dodoma in 1996, it continues to serve as the seat of most government administration and capital for the surrounding region. Tanzania remains one of the poorest countries in the world, but has benefited from its continued supportive relationships with foreign countries and international organizations. Both the World Bank and International Monetary Fund have provided funds to rehabilitate the city's out-of-date economic infrastructure and to alleviate its rampant poverty. Dar es Salaam is a major port not only for Tanzania, but for its landlocked neighbors. It is the entry point for tourists visiting the varied and unique natural features of Tanzania and is well positioned to benefit from any improvements to Tanzania’s economic fortunes. Dar es Salaam has the potential to be a prosperous city, but is restricted by its nation's difficulties. It is believed that continued and steady economic growth will lead to stability and the resolution of Tanzania's national issues. Dar es Salaam, an Arabic word meaning Abode of Peace, was the name given to the city by Sultan Seyyid Majid of Zanzibar in 1866. Dar es Salaam is located on a massive natural harbor on the Eastern Indian Ocean coast of Africa. Situated close to the equator and the warm Indian Ocean, the city of Dar es Salaam experiences a tropical climate, typified by hot and humid weather throughout much of the year. The average maximum daytime temperature in January is 90°F (32°C), dropping to an average maximum of around 84°F (29°C) in July. There are two distinct rainy seasons, "the long rains" which fall during April and May, and "the short rains"—during October and November. Annual rainfall is approximately 43 inches (1100mm). Downtown Dar es Salaam includes numerous small businesses, many of which are run by traders and proprietors whose families originated from the Middle East and Indian sub-continent areas with which Tanzanian coastal settlements have had long-standing trading relations. During the daytime, heavy traffic, throngs of office workers, busy merchants, street vendors and restaurateurs create a frenetic and slightly claustrophobic air. However, after nightfall the area is relatively quiet as much of the city's nightlife is located away from the city's mainly commercial center. The sprawling suburbs furthest from the city center are populated by Tanzanians of African descent, with the exception of Oyster Bay, where there is a large population of foreign expatriates. 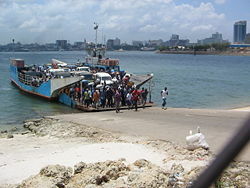 Dar es Salaam is spreading rapidly, taxing the transportation network which, aside from ferries, lacks mass transit facilities. 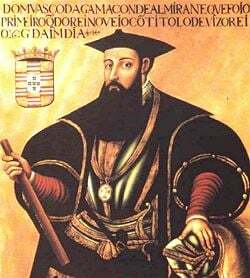 Vasco da Gama reached the East African coast in 1498. 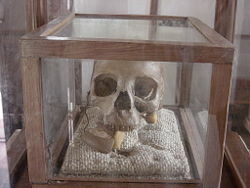 Skull of Chief Mkwawa on display at the Mkwawa Memorial Museum, Kalenga, Tanzania. 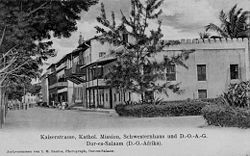 Kaiserstrasse, Dar es Salaam, German East Africa, c. 1905. Tanzania is the location of the pre-human Laetoli footprints, estimated to be about 3.6 million years old. Travelers and merchants from the Persian Gulf and Western India have visited the East African coast since early in the first millennium C.E., and especially towns along the coasts of Kenya and Tanzania late in the millennium. By the beginning of the second millennium C.E., Swahili towns conducted a thriving trade with Africans in the interior and trade partners throughout the Indian Ocean. From c. 1200 to 1500 C.E., the town of Kilwa, on Tanzania's southern coast, was perhaps the wealthiest and most powerful of these towns, presiding over what some scholars consider the "golden age" of Swahili civilization. In 1498, Vasco da Gama became the first known European to reach the East African coast. By 1525, the Portuguese had subdued the entire coast, retaining control until the early eighteenth century, when Arabs from Oman established a foothold. Claiming the coastal strip, Omani Sultan Seyyid Said (1797-1856) moved his capital to Zanzibar City in 1840. He focused on the island and developed trade routes that stretched as far as Lake Tanganyika and Central Africa. During this time, Zanzibar became the center for the Arab slave trade. In 1859, Albert Roscher of Hamburg became the first European to land in Mzizima ("healthy town"). Dar es Salaam fell into decline after the death of Seyyid Majid who was Sultan of Zanzibar from 1856-1870. In 1877, the first of a series of Belgian expeditions arrived on Zanzibar. Dar es Salaam remained a small port until the German East Africa Company established a station there in 1887. The town grew from 1891 to 1916, as the administrative and commercial center of German East Africa. While the German administration brought cash crops, railroads, and roads to Tanganyika, European rule provoked African resistance. Between 1891 and 1894, the Hehe ethnic group—led by Chief Mkwawa (1855-1895)—resisted German expansion, but were eventually defeated. After a period of guerrilla warfare, Mkwawa was cornered and committed suicide in 1898. The Germans exercised such brutality that in 1902, a movement against forced labor spread along the Rufiji River. Known as the Maji Maji War, this was the bloodiest rebellion in the region, with indiscriminate murders perpetrated against farmers, settlers, missionaries, planters, villages, indigenous people, and peasants. The British captured German East Africa during World War I (1914-1918). Dar es Salaam was retained as the administrative and commercial center of the territory and from then was referred to as Tanganyika. Under British indirect rule, separate European (Oyster Bay) and African (e.g. Kariakoo and Ilala) areas developed at a distance from the city center. The town's population also included a large number of South Asians. After World War II (1939-1945), Dar es Salaam underwent a period of rapid growth. Political developments, including the formation and growth of the Tanganyika African National Union (TANU), led to Tanganyika attaining independence from colonial rule in December 1961. 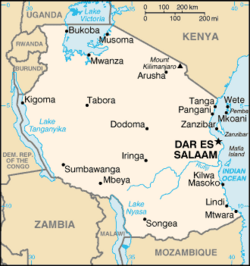 Dar es Salaam continued to serve as its capital when in 1964 Tanganyika and Zanzibar merged to form Tanzania. However, in 1973 provisions were made to relocate the capital to Dodoma, a more centrally located city in Tanzania's interior. The relocation process has not yet been completed, and Dar es Salaam remains Tanzania's primary city. One of the deadliest 1998 U.S. embassy bombings occurred in Dar es Salaam; the other was in Nairobi, Kenya. Map of Tanzania showing its neighbors. The president is both chief of state and head of the government of Tanzania. The president and vice president are elected on the same ballot by popular vote for five-year terms and are eligible for a second term. The unicameral National Assembly, or Bunge, comprises 274 seats, to which 232 members are elected by popular vote, 37 are allocated to women nominated by the president, and five to members of the Zanzibar House of Representatives. All serve five-year terms. Dar es Salaam is the capital of the Dar es Salaam Region, which is one of Tanzania's 26 administrative regions. 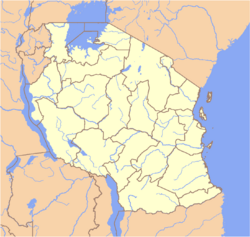 The Dar es Salaam Region consists of three local government areas or administrative districts: Kinondoni to the north, Ilala in the center of the region, and Temeke to the south. The Kinondoni District is broken into four divisions, 27 different wards, and 113 sub-wards, the Ilala District is subdivided into three divisions and 22 wards, while the Temeke District is divided into three divisions and 24 wards. Each district has at least one council, known as a local government authority. The city of Dar es Salaam is governed by a city council. Elia complex and Muslim graveyard, city centre. Tanzania is one of the poorest countries in the world. The economy depends on agriculture, which accounts for more than 40 percent of gross domestic product (GDP), provides 85 percent of exports, and employs 80 percent of the work force. Topography and climatic conditions, however, limit cultivated crops to only four percent of the land area. Industry traditionally features the processing of agricultural products and light consumer goods. The World Bank, the International Monetary Fund, and bilateral donors, have provided funds to rehabilitate Tanzania's out-of-date economic infrastructure and to alleviate poverty. Dar es Salaam is Tanzania's most important city for both business and government. About one half of Tanzania's manufacturing employment is located in the city despite the fact that only ten percent of population lives there. As an administrative and trade center, Dar es Salaam has benefited disproportionately from Tanzania's high growth rate since the year 2000. Tanzania's per capita GDP was estimated at $1300 in 2007. The picturesque harbor, beautiful beaches, and thriving nightlife have made the city a tourist destination. Railways connect Dar es Salaam to Kigoma on Lake Tanganyika, to Mwanza on Lake Victoria, and to Zambia on its western border. Located on a natural harbor on the Indian Ocean, Dar es Salaam is the outlet for mainland Tanzania’s agricultural and mineral exports, and for the nearby land-locked countries of Uganda, Rwanda, Burundi, the Democratic Republic of the Congo, Zambia, and Malawi. The Julius Nyerere International Airport connects the city with other African countries, the Middle East and India, as well as with Europe. Dar es Salaam metropolitan area had a population of 2,497,940 people in 2002. With a population rate increase of 4.39 percent annually, it has become the third fastest growing city in Africa (ninth fastest in the world) after Bamako and Lagos, respectively. The metro population is expected to reach 5.12 million by 2020. Although there is no racial hostility, the various ethnic communities of Dar es Salaam do not tend to mix heavily. Mainland Tanzania's population is 99 percent African, of which 95 percent are Bantu consisting of more than 130 tribes. The other one percent consists of Asian, European, and Arab people. English is the official, primary language of commerce, administration, and higher education. Kiswahili (Swahili), another official language, is the mother tongue of the Bantu people living in Zanzibar and nearby coastal Tanzania. Mainland Tanzania's religious affiliation comprises 30 percent Christian, 35 percent Muslim, while 35 percent follow indigenous beliefs. Dar es Salaam is home to the University of Dar es Salaam, the Open University of Tanzania, the Hubert Kairuki Memorial University as well as the International Medical and Technological University. Other institutes include the Institute of Financial Management, Dar es Salaam Institute of Technology, and the College of Business Education. 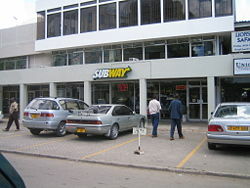 A branch of the international Subway restaurant chain in Dar es Salaam. Dar es Salaam has a variety of museums, including the National Museum, and the Village Museum, as well as the Botanical Garden. Within an hour's drive north is Bagamoyo, which is home to the Kaole ruins of two mosques and several tombs. There are beaches on the Msasani peninsula north of Dar es Salaam and in Kigamboni to the south. Trips to the nearby islands of the Dar es Salaam Marine Reserve are a favorite spot for snorkeling, swimming and sunbathing. The city offers a diversity of cuisine, ranging from traditional Tanzanian barbecue such as "Nyama Choma" (roasted meat) and "Mishkaki" (Shish Kabob—usually barbecued and served with salt and various hot peppers), traditional Indian and Zanzibari cuisine, as well as Chinese, Thai, Turkish, Italian, and Japanese food. The music scene includes live dance bands such as Kilimanjaro, Twanga Pepeta and FM Academia. Taarab which was traditionally strong in Zanzibar has also found a niche. "Bongo Flava," a broad category that represents the Tanzanian take on hip hop and R and B, has become the most popular locally produced music. Traditional tribal music is performed at weddings. The National Stadium hosts Dar es Salaam's Young Africans Football Club, Simba football club, other Tanzanian football clubs, and international matches. The first cineplex in Tanzania to show first-run Western and Indian releases was opened in Dar es Salaam in December 2003. Tanzania moved from one-party rule to democratic elections in 1995, but was in 2008 one of the poorest countries in the world. The economy depends heavily on agriculture, which accounts for more than 40 percent of GDP, and agriculture is limited by topography and climatic conditions. Tanzania has issues with corruption. Dar es Salaam has features that mean it is well placed to benefit from any improvement in Tanzania’s economic fortunes. 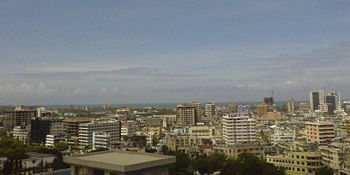 As well as being the country’s largest and richest city, and capital for the surrounding region, Dar es Salaam is the outlet for mainland Tanzania’s agricultural and mineral exports, and for the nearby land-locked countries of Uganda, Rwanda, Burundi, the Democratic Republic of the Congo, Zambia, and Malawi. Tourism is another growth area. Dar es Salaam's picturesque harbor, beautiful beaches, and thriving nightlife, as well as Tanzania's natural wonders, including Mount Kilimanjaro, Africa's highest mountain, and Lake Victoria, the world’s largest lake, as well as wildlife in its national parks, such as the Serengeti, have made the city a tourist destination. ↑ City Mayors Statistics, The world’s fastest growing cities and urban areas from 2006 to 2020 Retrieved September 18, 2008. World Fact Book. 2008. Retrieved September 12, 2008. History of "Dar es Salaam"
This page was last modified on 14 November 2017, at 19:09.